I rarely hit the thrift shops anymore as all the little independent shops are disappearing and the chains like Goodwill have gone "upscale". Usually my best bet are estate & yard sales. But yesterday after a lovely afternoon of cooling off in the pool my friend Jeanne over for a visit & I had a few hours to kill before supper so off we went to a Goodwill. Jeanne must be a lucky charm for me as whenever we go thrifting I find at least one AMAZING find. Once I found a vintage YSL Rive Gauche blouse balled up with a bunch of scarves for $2! time, a perfect condition 60s chartreuse swimsuit, the list goes on. This visit I wasn't hitting it, nothing catching my eye, prices all crazy. I happened to just waltz by the linen section (which I rarely do as lately all you find are cheap curtains and stained crappy tablecloths) when a pattern hit my eye. I of course ran my hands over it & found that it was vintage brand new barkcloth. Now intrigued I took it off the hanger & Jeanne & I stretched it out. 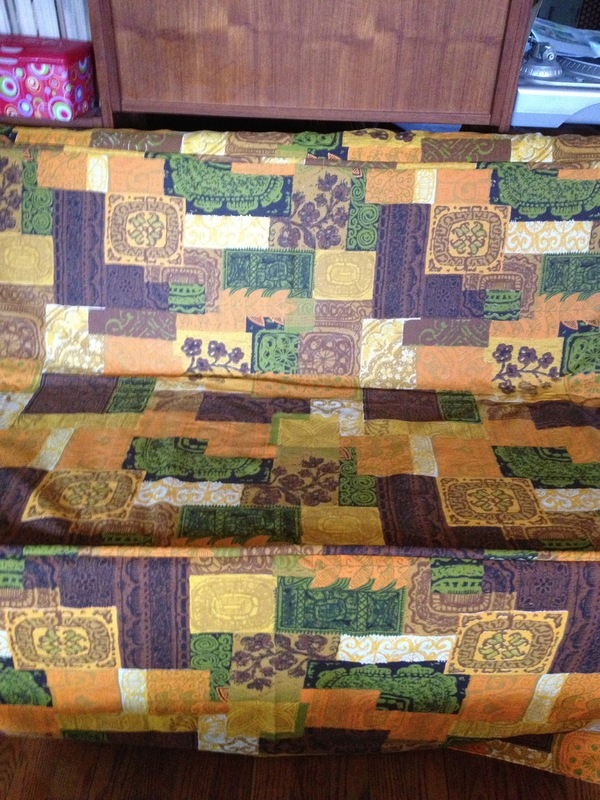 At first I thought it was a sofa cover, then I realised it was a bedspread. Priced at $19.99. 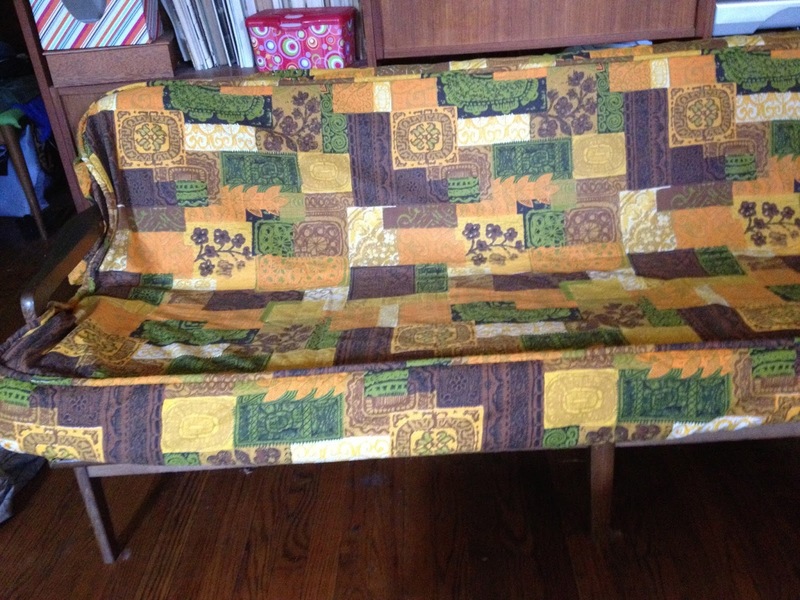 So my mind started racing wondering if I could use it somehow to cover the 60s sofa we have. 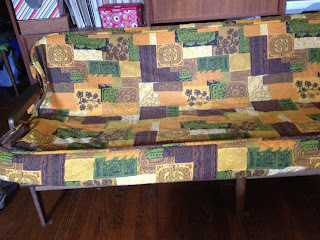 Then it hit me, we had to dump the original cushions as they were disintegrating, and being lazy, we got a futon, I scored it with a box cutter so it would be an "L" shape & its very comfy. And this bedspread looked to be the same size as the futon. So I took a chance. With my Goodwill points, I only wound up paying $10 for it. So now my living room is truly a riot of pattern with my Picasso print drapes! 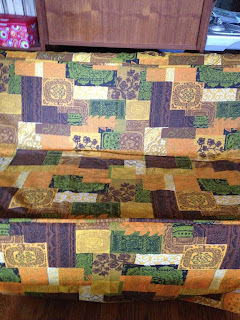 Eh I love it, its interesting and besides barkcloth is such a workhorse, I have original 1940s drapes still in perfect condition and as bright as the day they were made! Oh and Jeanne? She found a HUGE Bally tote for $20, plus some cool scarves. Not too bad considering I wasn't expecting anything interesting! What a great score! and at a very good price. I adore barkcloth. How do you get goodwill points? Soooo much fun! It looks great! The current version of my Bally bag on Madison Ave. retails at 1K! Wow that was our lucky day!